NEW YORK — Toys R Us and Bon-Ton may be gone but they haven’t been forgotten. Companies such as Target and online mattress company Casper are creating playbooks to pick up market share that those and other defunct or dying retailers left behind. In Lima, both the Sears and Toys R Us locations shuttered since last Christmas shopping season. Kohl’s is also adding more beauty products, which had been an area of expertise for Bon-Ton, the York, Pennsylvania-based department store chain that closed the last of its stores in August. Kohl’s believes one-third of its store base is benefiting from department store closings, up from one quarter a year ago. Target CEO Brian Cornell estimated up to $100 billion in market share that’s now up for grabs — about double what he foresaw just a year ago. In response, the company is accelerating its store remodels in areas where bankrupt retailers once had stores. 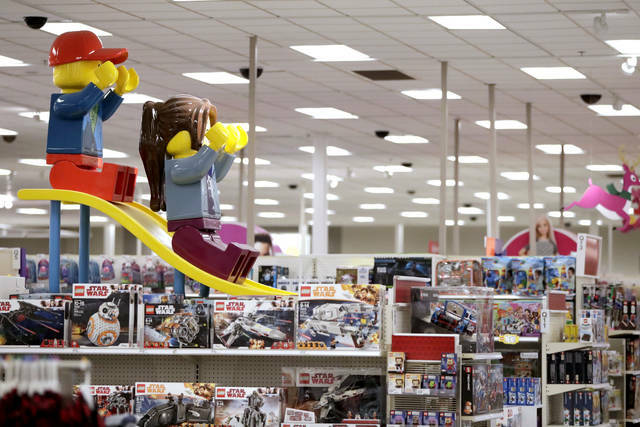 Target has devoted extra space at 500 of its stores for bigger toys such as electric cars, playhouses and musical instruments, as well as adding nearly 200 more products. About half of those locations are about five miles from former Toys R Us stores. In 2018, there have been roughly 30 retailers that have filed for bankruptcy, including household names like Sears Holdings Corp., Mattress Firm and David’s Bridal. That compares with 41 last year — the highest since 2011, according to S&P Global Market Intelligence, a research firm. Both Toys R Us and Bon-Ton liquidated this past summer, just months after trying to reorganize in bankruptcy court. The rampant closures don’t tell the entire story. In fact, according to research firm IHL Group, 2018 will see a net growth of more than 3,800 stores, with 12,664 stores opening this year and 8,828 shuttering. And the closings represent a concentration of retailers. This year, 16 retailers represent 66 percent of the closings, compared with 48 percent last year. The National Retail Federation expects holiday retail sales to increase as much as 4.8 percent over 2017. The sales growth marks a slowdown from last year’s 5.3 percent but remains healthy. Lowe’s CEO Marvin Ellison told AP he estimates about $2.5 billion to $3 billion up for grabs in appliances; for home improvement, that figure is anywhere from $600 million to a billion dollars. Lowe’s has been expanding its appliances, and started stocking up on Craftsman tools, which Ellison thinks has attracted Sears shoppers. “No one is going to be able to fill the Toys R Us void,” said Isaac Larian, CEO of MGA Entertainment, the maker of the highly popular LOL toys. His overall global business has tripled, but at Little Tikes, known for its large size toys like cook kitchen sets and toy cars, business is down 11 percent, leaving its factory in Hudson, Ohio, often idle. “I’m looking at everything possible to find other ways to fill that factory,” he added.